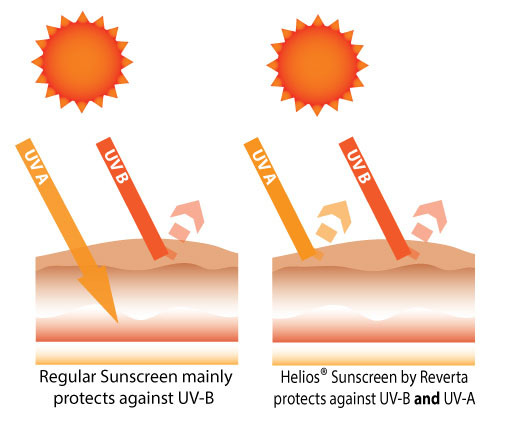 Helios® Natural Sunscreen by Reverta provides superior broad spectrum UVB and UVA protection in a unique, patented natural formula based on amino acids (building blocks of proteins). Helios® sunscreen does not contain any chemical sunscreen ingredients, which could irritate the skin and are potentially hazardous. 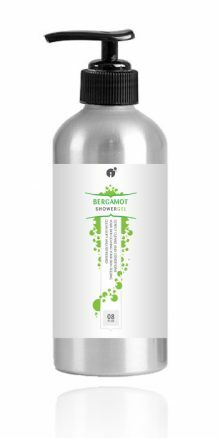 This sunscreen is beneficial for all sensitive skin types, such as rosacea, eczema and psioriasis. 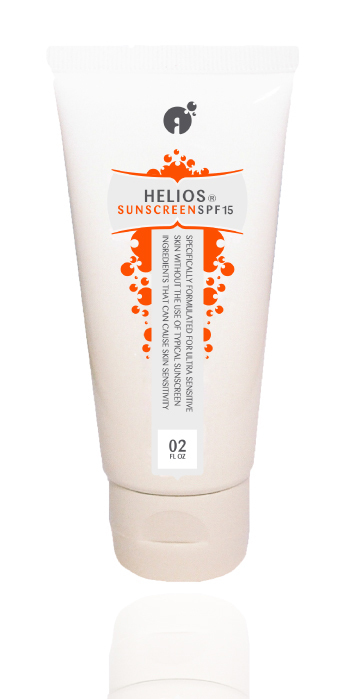 Helios sunscreen is formulated with the mineral titanium dioxide to reflect harmful UV rays and natural amino acids (food-grade) to absorb UV light that has not been reflected. Most sunscreens on the market today contain a variety of chemical sunscreens that have been proven in numerous scientific studies to either irritate the skin and to varying degrees are harmful to our health. For example, the UV-absorbing chemical Oxybenzone enhances the skin penetration of other chemical sunscreen ingredients and has been linked to skin irritation and disruption of hormonal balance (acts like estrogen). In addition, most of these chemical sunscreen ingredients will build up in our bodies over time, without being broken down by the liver. There are nine FDA-approved chemical sunscreen ingredients that are known hormone disruptors. The hormones that are mostly affected by chemical sunscreen ingredients are estrogen, progesterone, testosterone and the thyroid hormones. This can cause serious health problems in the long run, such as premature development in children, gynecomastia in men and infertility. If you have rosacea and you have used a chemical-based sunscreen on your face, you may have noticed the extreme skin irritation that it caused. Kind of a betrayal, because you thought that a sunscreen product that was supposed to protect your skin from the sun causes severe skin irradiation and inflammation, resembling a sunburn. Not only do the chemical ingredients irritate the skin, many of these sunscreens are also waterproof. Sunscreens are made waterproof by adding various forms of silicone, an ingredient that can also prevent the skin to breathe, which results in trapped heat. Furthermore, many so-called waterproof sunscreens are less water resistant than you may think and the FDA has recently prohibited the use of terms such as waterproof, sweat proof and sunblock on sunscreen products. Helios® does not contain silicones or oils that can trap heat. Helios Sunscreen by Reverta uses natural ingredients to protect against UV-B and UV-A rays. Many people believe that when they’ll use a sunscreen with a high SPF, that they’re protected from the sun. The term SPF (Sun Protection Factor) is actually quite misleading as it only measures the amount of UVB rays being absorbed. 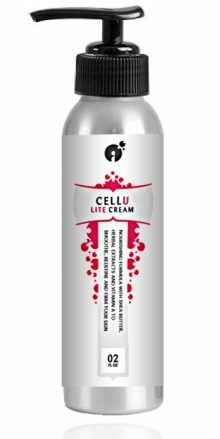 It doesn’t take into account UVA rays, which are more damaging to the skin in the long run as UVA rays penetrate the skin deeper and generate more free radicals. UVA rays prematurely ages skin and breaks down collagen. Most sunscreen products use chemical ingredients that mainly protect against UVB and not UVA. Did you know that 95% of the UV rays reaching the earth’s surface consists of UVA rays? This means that in the sun your skin is exposed to 10 to 100 times more UV-A rays than UV-B rays. For that reason, you’re not 100% protected against the sun’s harmful effects on your skin when using a regular sunscreen. UVA rays amplify the damaging effects of UVB rays and are frequently considered the main cause of many skin cancers. Using a sunscreen (in particular with a high SPF) gives people a false sense of security as they offer protection against sunburn, but don’t protect against the long-term skin damage of UVA. Mineral sunscreen ingredients such as titanium dioxide in Helios® offer the most effective protection against UVA rays. Many regular sunscreens on the market contain chemical UV-absorbing ingredients that penetrate the skin. These chemical UV filters work by absorbing UV rays. 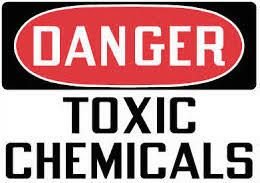 What this means, is that upon exposure to the sun, these chemicals are broken down. 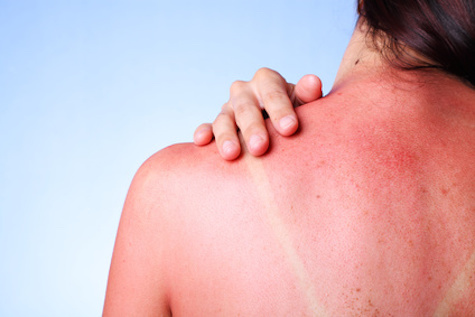 For this reason, regular sunscreen products lose their protection the moment your skin is exposed to the sun. As a matter of fact, 90% of chemical sunscreen ingredients lose their effectiveness after 1 hour in the sun. As a result, you have to re-apply regular sunscreens fairly often and more often than what is stated on the label. The fact that a sunscreen product is labeled “water-proof” does not mean that it should not be re-applied more often. Helios® by Reverta is different: the natural mineral titanium dioxide provides a shield on the surface of the skin and reflects a large portion of the sun’s UV rays. Titanium dioxide is very stable and does not get broken down in sun light. No chemical reaction takes place when exposed to sun light. Any UV rays that penetrate the titanium dioxide barrier, will get absorbed by a mixture of natural amino acids (building blocks of proteins). For these reasons, Helios sunscreen protect your skin longer and more effectively than regular sunscreens with chemical ingredients. As long as the product doesn’t rub off, you’re protected. Since everyone sweats and most people use sunscreens around water (pool or the beach), we recommend that you re-apply the product after 2 hours and immediately after swimming. Many mineral sunscreens containing titanium dioxide and zinc oxide often result in a sticky, white film, which is uncomfortable and not very appealing. Helios by Reverta uses micronized titanium dioxide, which will blend much better with your skin. Apply thin layer of sunscreen to entire face. Let dry for 5 minutes. If white residue is visible, wipe off with slightly moist towel. Please Note: This sunscreen offers protection for 1-2 hours. This sunscreen is NOT waterproof. Re-apply after 1-2 hours or after swimming and excessive sweating. It is advised to wear additional sun protective clothing, such as a hat. For external use only. Paraben-free. Cruelty-free. Our White Tea All-Over Body Lotion is the ultimate defense against dry skin.